C&C regarding the topology are very welcome. 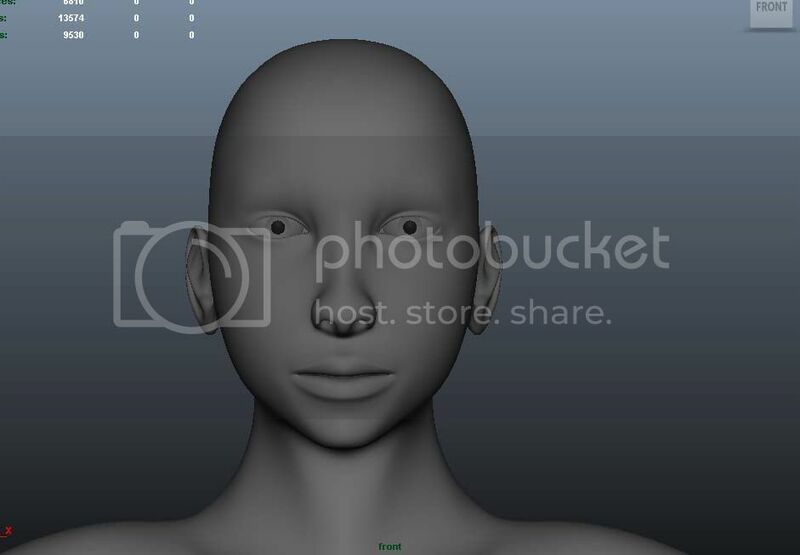 I think your topology is quite good, although I’d place a couple loops around the mouth. I’ve already seen this kind of topology (there http://www.polycount.com/forum/showthread.php?t=80005 ), and I thought its “incomplete”. in addiction, you should maintain your polygons with almost a quad form (look at the neck). 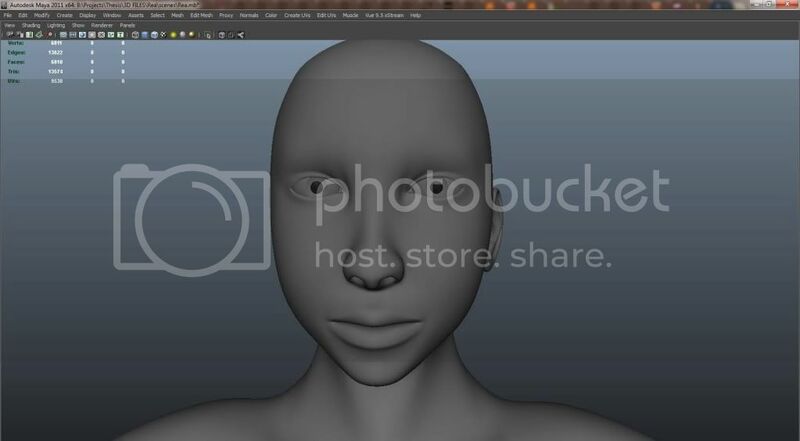 It prevents your model from creasing and various unwanted issues in the animation stage. 2mister3d: well, IMO area in the middle of nose and mouth isn’t that good. And then, in ‘the pole’ you talk about noob models; those come out quite smooth. What can you suggest to pass this level? Do you think that ‘traditional modeling’ and the attention to the topology flows is outdated nowadays with release of sculpting sowtwares?? I think that attention to the flow of topology is just as important as ever. What has changed is how you get there. In the past, you considered the topology before you start modeling and you developed the model at the same time as the topology is taking shape. Nowadays, with the advent of sculpting software, you can do all the character creation without any consideration until the last moment. But you still need good topology for good deformations and good topology allows you to cut down on the polygon count tremendously. That’s still important. There are very specific rules to good topology and that lends itself to some type of automation. Personally, I think that soon you will start to see more and more auto-topology tools coming to market in the coming years. Tools similar to 3DCoat’s auto topology tools. I for one find it pleasurable to work out a sculpt without any attention to topology, then to take it into Topogun for topology. This is so much faster for me and so much more flexible than the edge extrusion modeling I used to do before Mudbox. Exactly, I can’t even imagine starting a detailed character from a box, without having some sort of concept sculpt to work from. Also, the actual layout for your models has changed a bit too, thanks to faster computers. Now you can use more polygons and still work fast enough, but have better control over the deformations. This also means you can sometimes prefer to just imply the detail instead of following it, because the mesh is dense enough. For example there’s the neck. 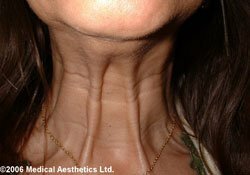 I would not fit my loops to the sternocleidomastoid muscle any more but follow the muscle directions of the platsyma instead. But since we have lots of polygons, the sternocleidomastoid will also have good definition. And if we build the model on top of a concept sculpt we can tweak the layout and keep adding loops as necessary, until all the detail we want is there. You’ll also find that more detailed meshes will give you even better looking blendshapes, you’ll have to struggle less with inadequate resolution and strange forms. Where this leads to is an interesting question, as we’ve all seen that when you have a million polygons you can sculpt nearly anything in zbrush or mudbox that’s relevant to the deformations, and still have it all in the mesh, with no need to look into animated displacements (which can become very, very tricky and time consuming). But even at that point, topology still matters, at least in my experience, it’ll still be better to have the general edge flow support the main directions of the deformations and wrinkles. For example there's the neck. 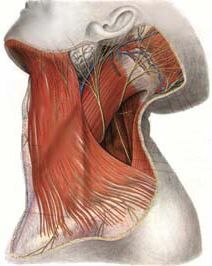 I would not fit my loops to the sternocleidomastoid muscle any more but follow the muscle directions of the platsyma instead. Hey Laa-Yosh, I know exactly what you’re talking about with respect to starting models without a roughly blocked out sculpt, and I find it much more efficient starting out in ZBrush and then moving to Topogun. But I do want to know how often studios use traditional modeling techniques such as starting from a primitive and working upwards, adding form and refining topology. While I’m very well versed with Maya’s modeling tools, I honestly haven’t created an organic model from start to finish in Maya in over a year, though use it for all my inorganic models. Additionally, should a portfolio or demoreel reflect such workflow? Lastly, I was a little confused about what you said in relation to topology around the neck. Are you saying that if I’m planning a displacement map I can add the forms in Zbrush and simply have topology similar to what’s in the left image below, as opposed to what’s in the right one? 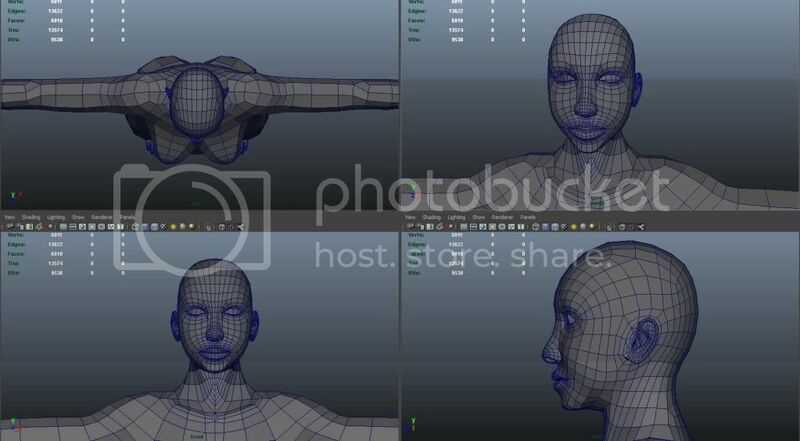 But I do want to know how often studios use traditional modeling techniques such as starting from a primitive and working upwards, adding form and refining topology. I don’t know but I’d guess it’s not too common. Sculpting is way way faster to create and refine concepts, most studios have always worked like that and the only change is that now they’ve gone mostly digital and clay + scanning, or rapid prototyping, is only involved in rare cases. What I’d look for is good skill at rebuilding on top of concept scultps, and having a good eye for topology that works, avoiding too many n-sided vertices (there are many ways to terminate or add loops and not all are equal) and so on. I’d use the topo on the left, yes, but with a lot more geometry. Here’s the neck part of a head I’ve just finished yesterday to show you what I mean. Also note that most of the edge flow is continued through the jawline like this, so edges run at an angle, about 40-50 degrees, to the shape of the bone. But it’s okay, because that line isn’t that sharply defined anyway; and when you open the jaw, you want to make it appear to slide under the skin and push vertices out that are on the neck in the closed jaw base shape. I did not include shots of the concept sculpt but you can see that it has a vein on the neck, too, and the place where wrinkles are forming when the head is turned down or the jaw is opened to the max. I could also make him pretty nice swallowing blendshapes with the adam’s apple moving up and down this way. And the entire head is like 9000 polygons altogether. Granted it’s a relatively young man, an old face would probably take some more work, more edge flow changes, and probably more polygons too. Pay attention to the fleshiness of the blendshapes in particular. Pretty hard to do with low poly models. All af the above only apply to mostly realistic, detailed models that you want to animate, of course. If you’re only going for still images or cartoonish designs then it’s all quite different again. Even if the computer could handle an animation with millions of polys, you can still shave of millions of polys by bringing the model into topogun, retopologizing, bringing your subd levels back to get your details. When you are talking about a scene that may contain various models with million+ polys, believe me it makes a difference, even when working with the kind of machines Weta has. If you look at the Avatar models, though they are dense, the edgeflow is still very nice. You could animate today with a very low res mesh in the viewport and displacements, to get insane speeds - however most studios prefer to have the detail and always push their models and rigs to the maximum that they can handle. And there are many tools and approaches to manage even very detailed scenes, for example just because you want to eventually render 10 or 100 detailed characters does not mean that your animator has to load them all. Thanks a lot for the replies. I’m guessing exceptions would be when you’re limited in terms of how much your PCs can handle or if a certain muscle or muscle group is very prominent and also deforms significantly. In such cases you would need to define separate loops for those areas, right? As mookiemu was saying, though the polycounts on the meshes were high, they did focus largely on topology as opposed to displacement or normal maps. Their reasoning behind this was that they could not essentially animate the larger forms from a displacement map, so as far as possible they wanted actual deformable geometry. What exactly do you mean by these separate loops? Anyway, the idea is that skin moves independently of the muscles, there’s wrinkling and sliding over the underlying forms. If you only model the specific muscle patterns into the topology, you’ll have trouble to accommodate these kinds of deformations. In most cases it probably wouldn’t matter, but when you’re doing naked slim aliens (or big muscled guys) then you have to be mindful of these issues. So in practice, the best approach is to add some extra loops that run parallel to the edges of the muscle or bone forms. That way you’ll always have some extra geometry to slide around. Yeah, there are many possible issues with animated displacements. To stick with the face, if we follow FACS as a guide we’ll also need to have blendshapes to correct the bad looking deformations we get when we mix various action units. But if we add displacement based deformations, we are going to get the same combinatory explosion there as well - wrinkle patterns change a lot between various AU combinations so the displacements would have to get the same number of corrective extra maps. As far as I know Clu in Tron Legacy used displacements, but they had to be composited together for every single frame individually, from a large set of base textures. And the animator found out how the face looks only in the render because there was a lot of deformations that he had no feedback for. So if you can afford it, it’s better to animate everything with just one set of tools, which is the mesh itself (as you can’t do animation with displacements only). With that said, they can still be very useful, especially if you have a tension map plugin or such to drive them automatically. Lately I’m practicing organic modeling and topology. Right now I’m not much familiar with rigging\animation but I’m doing my best to build the correct topology for deformations. After a week I’ve finished a female body but I had some problems with approach I must take. A male body in most cases has pronounced muscle structure that help deformations AND defining the shape of the body. But the female body instead have less muscles, so the question is: do I have to define the muscles with edgeloops instead of shaping the overall masses and flesh??? Next I’d like to know something more about T Pose: what considerations I must take about neutral pose?? (And what consideration take an artist drawing a character in a certain pose??). I’ve seen a lot of characters in different poses: with straight hands/45degr., with palms facing downwards/towards, thumb downwards/towards, with legs spreaded to shoulder width and even with slightly bend, ecc. So, what’s the difference about them?? I want to ask you about time you spend in modeling stage, and some tips/tricks to reduce that, because IMO it’s important for a caracter artists. Do you think that’s only about practicing??? I should say that I have kinda’ tedious approach which slows my modeling workflow. I thought that sculpting/retopology method is faster rather than traditional modeling and maintaining a correct topology, so is there some advatages in the second method? Should I be concerned about topology at the beginning?? I hope that’s not an outrage to English language and you understand what I’m saying. Tamas, could you post some actual wireframes (not breaking the NDA of course)? We are very curious what topology do you use nowadays. Wow! That is so cool! I would have liked to have attended that. It all depends on the movements your characters are going to do in the animation. If your character is going to be raising it’s arms over his head a lot then the traditional 90 degree t-pose is probably the way to go. If not then the 45 degree is better. The idea behind the t-pose is to have all the body parts positioned in the middle part of their movement arc. For instance, if the majority of the movement of the arms will be from shoulder level to the sides of the body, then you the 45 degree arms on the t-pose is best because it splits the difference and it’s right between most extremes (personally I think the arms should be slight forward too). It make more sense when you consider that most of the time the character will have it’s hands by it’s sides and rarely do anyone’s hands go further back than the center point. Putting the body parts in the midway points of their movements creates less headaches and funky deformations later. I think that more and more, we are beginning to see more effective variations in the t-pose because of this. Especially for movie characters where the modelers pretty much know what movements the characters will be doing. That is why you are seeing the bent legs and arms. These are the actual midway movements to most characters. Straight legs and arms are the end of the movement so it can be a problem when the character crouches or bends it’s arms all the way. Unless you are Bay Raitt, the sculpting/retopology method is much, much faster and flexible than straight box modeling and edge extrusion. Especially if the character isn’t completely fleshed out and planned before you start modeling. If you are working from detailed image planes and all the thinking about the character is already done, then I think it’s possible to model traditionally and do it as fast as the sculpting/retopo method. But the beauty of the sculpting/retopo method is that it allows you to think while you are creating the character and it allows you to make drastic changes while at the creation stage that were very difficult before sculpting. And imho, it a lot more of an artist friendly/ interactive way of working. Sculpting/retopo also allows you to create the character in a non-standard t-pose a lot easier than the image planes/box modeling/extrusions methods. I haven’t done it in a long time, but I would go crazy if I had to go back to my old edge extrusion way of modeling people. For organic forms, sculpting/retopology rules. On the other hand, when it comes to modeling tables, chairs, and other inorganic objects, box modeling rules. Especially with the polygon smoothing tools that are available today. Well, I’ve got some stuff stuck in legal steps (DA2 and ME3) which I hope to get released on Matt Clark’s website for Wrapit as soon as we’re done with our current deadlines… But that’s already obsoleted. New stuff I can’t show because it’s unannounced… but I’ve posted the Neytiri wires before, that’s what we use as reference (and Kissb too). The two heads I’ve been working on recently are about 9000-9200 faces and that includes the collar bones in front, too. I still need some practical experience with some of the areas (mostly the lower cheek bone area) but the more polygons approach certainly works very well. I could be wrong and Laa-Yosh knows a lot more about this than me, but I think we will start to see the bent leg/ 45 degree arms t-pose much more in the coming years. Heh, I’m not too informed either I can pretty much agree with most of what you’ve written though. About 45 degrees for the arms are what we’ve been doing for years now, it’s very rare for most characters to lift their arms high and stay in that pose for long. We also do a lot of stuff lately that involves clothed characters, so we can cheat a bit on the shoulder deformations. Elbows and even knees are slightly bent, but the knees are only by a few degrees. This is to help the IK handle detect the preferred angle for the joint it has to drive. We generally position the feet facing straight forward - it’s easier to rig proper controls for the feet rotations, reverse foot and so on. Oh and the stance should be about shoulder width usually. Finger joints are slightly bent for the same reasons, but we also re-use hand skeletons a lot - it’s important to test in practice to see that you got the joint placement right, we did this by parenting simple boxes to the joints and made both a straight hand and a fist. It also helps if you start from a real person’s hand, just put it in the scanner, but it’s also a good idea to do a concept sculpt pass as well. In general it’s better to have some sort of a realistic stance for the character and not an aritificial ‘every joint is zeroed out’ pose. It helps in every possible way, easier to sell a concept, easier to see the volumes, silhouettes, it’ll be better in movement as well. Texturing isn’t much of an issue, if you keep the arms at 45 degrees you can still reach the armpits in 3D painting apps. I’m not sure how our riggers handle the mocap part though, because Motion builder requires a T-pose for fitting and so they have to do some initial rotations to the deform/keyframe rig when processing mocap data. And yeah, concept sculpt -> retopo is a no-brainer nowadays, IMHO. Honestly, as great as the workshop was, I’d much rather have frequent figure/life drawing sessions readily available around here. I’ve had to learn everything I know about anatomy from books and the internet. The last part is sort of what I meant. Where you need skin deformation, you have the topology flow in the direction the skin will deform and where you need muscle deformation, you have edgeloops around muscles when needed, is that a good idea? Skin deformation always overrides everything else in my book… I have yet to try my hands at something like a naked human torso with high res geometry, but I’d certainly try to use pose space deformation systems to drive the skinning. The thing is that motion capture data can quickly create crazy rotations and if you’d have the joint angles driving standard blendshapes, allyou’d get is a mess. Michael Comet had a plugin for Maya, and now there’s the beta for JoeAlter’s stuff that’s also including sculpting tools and hierarchical subdivs - although that’s not necessarily ready for production. Anyway, if we would somehow get a project with a character like that, I’d certainly write a post about my experiences. Is there a book or extensive DVD training on all of this?